يقع Port Arthur Motor Inn في بورت آرثر ويضم حديقة وخدمة الواي فاي المجانية. يقع الموتيل على بعد حوالي 600 م من ميناء آرثر، وعلى بعد 29 كم من Dunalley. يتم تقديم المأكولات البحرية والأطباق العالمية في المطعم في الموقع. تحتوي الغرف في الموتيل على مكتب وتلفزيون بشاشة مسطحة وحمام خاص وبياضات أسرّة. وتحتوي الغرف على تكييف، كما تضم بعض الغرف شرفة. تضم الوحدات منطقة جلوس، يمكن للضيوف في Port Arthur Motor Inn الاستمتاع بوجبة إفطار كونتيننتال أو بوفيه إفطار. يوفر مكان الإقامة تراس. وسيسعد موظفو مكتب الاستقبال بتقديم المشورة للضيوف عند الحاجة إلى التوجيهات. يقع Port Arthur Ghost Tours على بعد 500 م من Port Arthur Motor Inn، في حين يقع موقع بورت آرثر التاريخي على بعد 3.4 كم من مكان الإقامة. ويعتبر مطار هوبارت الدولي المطار الأقرب لمكان الإقامة حيث يقع على بعد 44 كم منه. Great location with gate direct to historic site. Room nice and clean and fresh. Entrance to hotel difficult to find and not sign-posted well. Could not have picked a better spot to stay when visiting the historic site. Checked in and straight away went for a wander around the site which is located right at the front door. Local staff very helpful and knowledgeable. Its an old fashioned typically Australian country motel so don't expect 5 star and you won't be disappointed. Rooms are small but warm and cosy and very well maintained with everything you need. Lovely little restaurant with open fire, bar and lounge area overlooking the site. Not much choice in this area, this is the cheapest around, and it's not cheap. It's next to the attraction. Room is nice, but there's no microwave, so we can't heat food, that's disappointing for this price. best accom for going to port arthur. the gate into the port arthur park is at the motel so no need to drive there. its perfect. the walk back to the motel after the ghost tour adds to the mystery too. great location. Clean, comfortable old-style motel in a fantastic location. Direct access to the historic Port Arthur site with your room key through the back gate. Buy site access tickets at the motel. Friendly, helpful staff. The motel is old but well maintained and has been kept fresh and modern. The dinner menu and dining room hours are limited but convenient and reasonable. 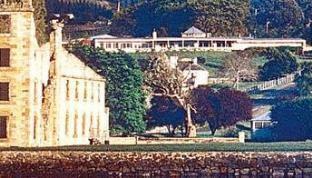 Excellent budget-friendly accommodation if you are visiting the Port Arthur site. The room : it is what it is. Can’t expect much, but the rudeness of the young lady upon our check-in is a big disappointment! No manner and insisted to have the person who made the booking to also do the check-in paperwork despite she is not the person staying (she made the booking for me, under my name). The senior lady was then involved and explained her that the person on the booking / staying are needed to fill out the paperwork. Unpleasant way to start the stay especially when I was doing late check-out after a long day on the road & explored the national park. Room itself is okay, I don’t mind. Very near to the Port Arthur Historical site. Not easy to find food though. You may need to book early or in advance either with the motel or the nearby restaurants. Good value for 2 spacious, interconnecting rooms. Restaurant was good too and they don't charge breakfast for kids (adults and teenagers are 10aud each though no hot food). It's passable. Unlikely i will return if I am back in the area. A cracking place to stay, with its own access path onto the Historic Site. The room was very clean and comfortable, with everything you need. The restaurant serves great food, and has fantastic views onto the Site. If you are in the restaurant around dusk, you will also be able to watch the wallabies come out onto the lawn in front (do note, however, that the restaurant stops serving at 8pm). The staff were extremely friendly and helpful. The only slight negative comment I have is that you have to pay extra to be able to access their Wifi (also note in this regard there seemed to be no mobile coverage anywhere in Port Arthur). The restaurant closed at 8 something that's a bit too early for travellers. The only good thing with this hotel is that we can walk freely into port arthur historic site. Staff is not very friendly. Limited wifi quota, very slow, staff stingy on sharing wifi voucher code. Restaurant close early. Direct access to the historic site. Room is clean but a bit ageing though. Totally it was the darkest and coolest night in port arthur. The view over Port Arthur was superb. Nothing could beat it. Certainly made the visit to this historical site more special.